The Los Angeles Times recently paid a lot of attention to the sale of the alternative news weekly LA Weekly. It turns out that the sale was to a group of Orange County investors with a record of making donations to Republican candidates. I have a long history with alternative news weeklies. During my Claremont cockroach years of the mid 1970s I could walk across Arrow Highway from my Olive Street apartment and find the Village Voice at the newsstand in the strip mall there. When I was in central Oklahoma I was classified advertising manager and later business manager at the community newspaper in Moore, Oklahoma. When that paper changed hands I responded (right as I was getting laid off) to an ad in Oklahoma City’s alternative news weekly, the Oklahoma Gazette, for a classified advertising manager. I got the job. When my late first wife Ruth and I made plans, for a variety of reasons, to move to the San Francisco Bay Area, I saw a notice in a publication that covered the alternative news weekly scene. It said a new alternative news weekly was starting up in San Jose. This was 1985, so it was snail mail and long distance phone calls, but the publisher, David Cohen (who came from the LA Weekly), hired me sight unseen as San Jose Metro‘s first classified advertising manager. I mostly hated the environment while at the same time was happy to be part of an alternative news weekly. So what, exactly, is an alternative news weekly? Mark Oppenheimer had a great discussion in the LA Times about this, partially in the context of the LA Weekly sale. In short he says it’s free + local politics + local arts. Exactly right. The sale of the LA Weekly means, in all probability, one less such outlet. Terry and I have been making good progress learning how to use our tortilla press. We pretty much have the process down. It’s a team effort and we’re doing it well. Recently I decided that I wanted to try tostada shells. That is less of team effort since the tortillas are put on a baking pan and then into the oven rather than being cooked on the stovetop. We gave it a shot and Terry helped where I needed assistance. I tried 10 minutes at 400, but that wasn’t enough so I made it 15. That worked. I pulled out what I thought was leftover tostada beans from the freezer. It wasn’t. It was leftover carnitas. It still worked. 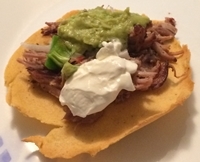 We had carnitas tostadas with fresh-out-of-the-oven shells. A pretty good weeknight dinner, really. I have long had the need to scan documents for various reasons. I’ve always used one of our all-in-one (printer, scanner, fax) devices, using the flat bed and letting the light bar do it’s thing. It was slow, tedious, and time-consuming. It turns out that my Dropbox iPhone app, which I installed primarily to move photos from my iPhone to my desktop computer, has a neat scan function. You simply center the document, hold your phone still, and the app draws a boundary around the page and scans the document. It creates a respectable PDF file which you can sync to your desktop computer or send to whomever you wish. It’s much quicker and less tedious than using the all-in-one flatbed. It works well. How cool is that? Form a lectionary standpoint this belongs on Advent 2, but it’s still Advent nonetheless. Recently I initiated a leftovers week in order to clear out all that stuff we had in our freezer. One day I pulled out the turkey we had brought home from Terry’s sister’s condo at Thanksgiving. I had sealed it up in the FoodSaver and frozen it. There wasn’t that much there, so I decided to make soup. I chopped it up and put it in the saucepan. I added some celery we still had from an earlier meal and then added some frozen mixed veggies that Terry had bought, wanting to to get more vegetables in her diet. I added vegetable broth I had in the pantry and then filled out the difference with water. I threw in some Penzeys Mural of Flavor seasoning. I let it simmer on the stove for a while. I served the turkey and vegetable soup with garlic bread. Terry loved it. It worked out well.